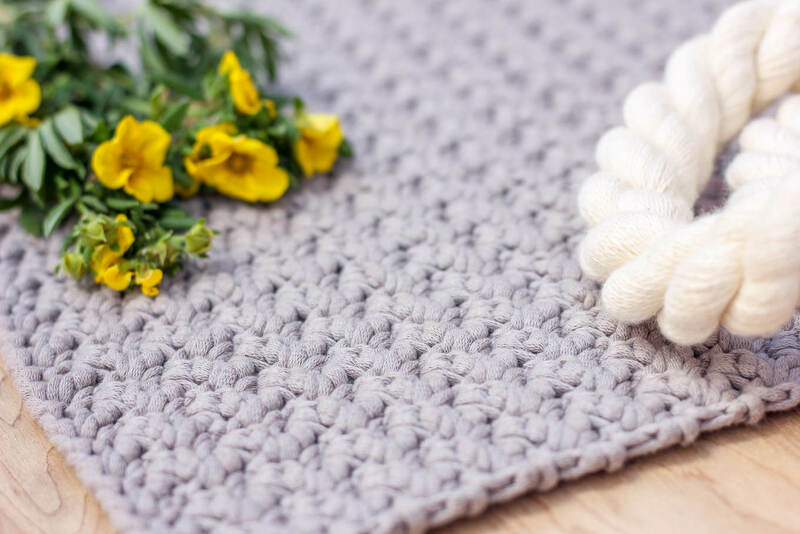 The Suzette crochet stitch is surprisingly easy and a perfect “fancy” stitch for beginners. Use it in my free Suzette bag pattern! 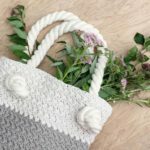 I recently shared a free crochet tote bag pattern that is made entirely using this one, simple stitch–the Suzette stitch! This pattern is perfect for beginners who want to move on from scarves and washcloths, but don’t want to have their head buried in a pattern while they crochet. 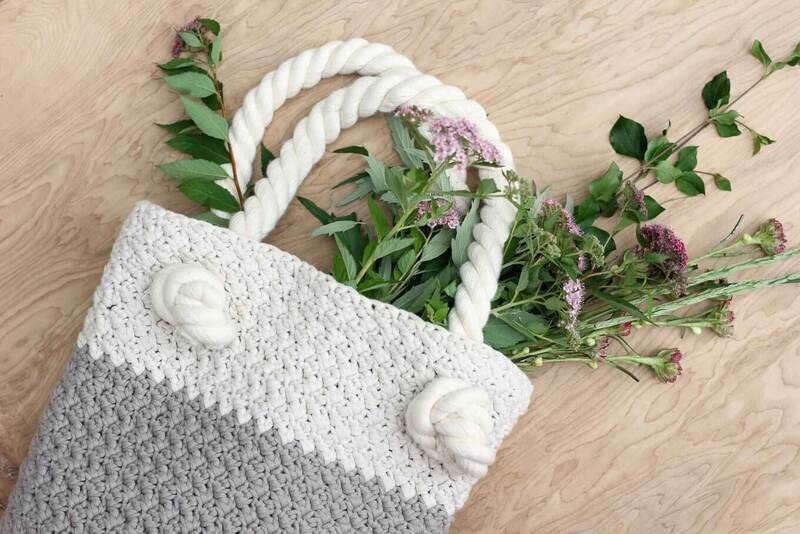 Once you master this one stitch, you’ll be well on your way to crocheting your own modern tote bag! For those of you who don’t know, this is my VERY FIRST VIDEO! Woohoo! It’s been a goal of mine to get tutorial videos up on Make & Do Crew since I started this site eight months ago, but this video business is intimidating! The technology. The lighting. My voice. All of it. Row 1: (1 sc, 1 dc) into second st from hook, *skip next st, (1 sc, 1 dc) into next st; repeat from * to last 2 st, sk 1 st, 1 sc in last st; turn. I hope to make a lot more tutorial videos, so please leave a comment for anything you’d like to see a video about! what type of yarn dI’d you use I love the color . It’s so pretty, isn’t it!? It’s Bernat Maker Home Dec yarn in “Clay”. You can find it at Michael’s. This is already a stitch callent the blanket stitch. I don’t believe this is your stitch. I had no intention of implying it was my stitch, just offering it up as a useful way to sew hexagons together. Thanks for telling me what other people are calling it. Thank you so much! I think this stitch would make a lovely afghan! You would just want to decide how wide you want it and then make sure you chain a multiple of two. (So like 52, 56…98 chains…anything like that.) You’ll end up with an odd number of stitches because one of the chains will be lost the the turning chain on the first row. Good luck! I’d love to see a pic if you make the afghan! This is not the same as the blanket stitch. The blanket stitch has a single and TWO double crochets. This is one and one. Gosh, Francine. Thank you for your kind comment. I really appreciate the feedback. I agree about being a visual learner. I like charts for the same reason. Do you like using charts? I’m thinking of trying to provide more of those too. Loved the clear tutorial on Suzette stitch … thank you! Thank you, I had been looking for a tight stitch to use for a heirloom baby blanket I am making and this was a perfect fit for one of the square! Great job on the video! That’s great to hear, Nina! I bet it will be beautiful in a baby blanket. Can you tell me the finished measurements of the bag please? Thank you, Jackie! I think this stitch is so surprisingly easy for how cool it looks. Hi there, thank you for showing how to do this stitch. Could you please direct me to a video that shows how to change colors. I’m new to crochet and have no idea the proper way to do this. I bet this one will do! Wow, love it! Thanks for sharing ? My pleasure, Pam! Happy crocheting! I’ve watched a fair number of video tutorials. What I most appreciate, besides the ongoing conversational repetition as you make each stitch, are the little tips of what to watch for or how to know which stitch you need next, etc. What a huge help! Gosh, thank you so much for your feedback. That is so wonderful to hear. As I edit these videos (and get very sick of the sound of my own voice), I begin to second guess if what I’m saying is useful at all. I’m so glad to hear that it is for you. Thank you so much for the tutorials! I hated handycraft in school because of the nasty teacher, so as a grown up woman I’m pretty bad at it! Thanks to You I actually learned how to crochet again!!! Really loving it and looking forward to new tutorials! This stitch is called the Grit stitch, not the Suzette stitch. I get really tired of scrolling thru Pinterest and finding all these duplicate patterns, using a different name. Very repetitive and irritating!!! I’m sorry you feel that way, Cherri. 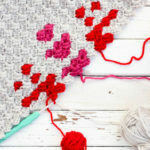 As a creative art and largely a word of mouth tradition, I think there are simply different names for the same crochet technique or stitch. I’m glad to know this is also called the grit stitch though. I’ll add that to the description and I’m sure it will help clarify things for other readers! Great tutorial. Very easy to follow. Thank you for sharing it. Thanks so much, Emilie. I’m glad it was useful for you! It’s called Bernat Maker Home Dec. It’s super awesome and crochets really smoothly! You can get it on Amazon (aff link) or at Michael’s, Joann’s, etc. Hello! Congratulations for such a wonderful work and great tutorial, I just have a question, how you close the bag? Close with the chains at the beginning and work as a tube or at the end? Thank you so much in advance for any help! Cheers! You can find the full pattern and tutorial here! I think that will answer your questions! It’s essentially a large rectangle that’s sewn together at the side and bottom. Loved your tutorial & mostly blanket & bag patterns. Just wanted to comment on the ladies upset about stitch names. I’ve been crocheting for many many years & have seen so many stitches, lots of the same stitched called different names. Bothers me that people can’t just enjoy & appreciate what one does for us. And your beautiful patterns which you are so kind to share with all of us. 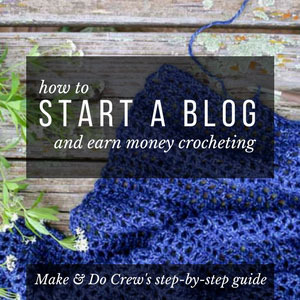 I agree–some of what I love about crochet is that there isn’t one “right way” to do it. For me, that kinda goes for technique, names, stitches–all of it. I appreciate your kind words and I’m so glad you’ve found my patterns useful! Happy crocheting! Haven’t watched the video but I’m sure it’s great after all the wonderful reviews. I just wanted to comment on how you have such a wonderful attitude and kind spirit. Your comments to the others where so nice and professional. Kill em with kindness! Love it! I’m sure God will bless you greatly for it! Keep it up. The stick is beautiful and I agree, I’d love to see a basket pattern when you have the chance. I was actually on Pinterest looking for one when I came across your bag, which is gorgeous, by the way! Thanks again, hun! Have a wonderful day and Happy Holidays! Thanks so much, Kadi. It feels pretty vulnerable sometimes to put myself out there online because every once in a while people can be pretty harsh in a way they might not be in person. But the VAST majority are just like you–totally gracious, kind and generous. Happy holidays to you too, Kadi! I think this stitch is a great simple one for baby blankets. If you want something that’s slightly more “fancy” looking, the Side Saddle Cluster stitch is gorgeous for blankets! Hi ! I currently crocheting a beanie using the suzette stitch but I can’t figure out how to decrease … Could you give me any tips ? I am new to crocheting and this looks like a somewhat simple stitch to start off with! If i want to make an infinity scarf (cowl, as some people maybe call it? ), how many chains would I need to start out with? Basically, how would I adapt the instructions you have to make a scarf? That sounds pretty! I think your easiest option would be to chain an even number of stitches until the chain is about as long as you’d like the scarf thick (maybe like 8 inches). Then working back and forth on that chain, you could just keep crocheting until the scarf is long enough to wrap around your neck as many times as you’d like. Once it is, fasten off and seam the beginning row of the scarf to the last row of the scarf so that you have one big loop that will function like a cowl. Does that make sense? This tutorial and this tutorial might give you some ideas for seaming. This was a really great stitch! Thank you! The only advice I would give is to maybe get in closer so that beginners like me can really see how the stitches are done. I will be checking out your videos in the future! Good point! I’m always trying to improve my videos. It’s a lot of learning as I go. Thanks for the feedback, Kristina. In the written tutorial , and in the comments, you say that this calls for chaining a multiple of 2 (even number) but in the video tutorial you say to chain an odd number. Since the count works for you in the video, I’m guessing the odd number is correct? Lol, yes, I think it’s an error in the video actually. So you’ll want to chain an even number of stitches so that you end up with an odd number of total stitches to work (since one is lost to the turning chain). If you want to start with a foundation single crochet, you don’t need the extra chain and you can just go straightaway with an odd number. This is what I did in the Suzette Bag pattern. I’m sorry for the confusion! Thanks! That sorts it out nicely! I answered the survey and then lost it. I can’t find it any more… I am Mexican, so I don’t buy yarn in the stores you mention. I knit and crochet. I love your videos and stith-tutorials. I’ll try to send (through Facebook) a picture of what I made with the Suzette Stitch. I want to thank you very much for your blog. I love it! Thanks so much for saying hello. I’d love to see a pic of what you made with the Suzette stitch! I shared the picture on Facebook because I can’t find the way to upload it here. Was looking for something different to make into a baby blanket. Just watched your video on the Suzette Stitch. I have crocheted for quite a long time and was wondering why you wrap your yarn one direction when pulling the loop through to make the first part of either sc or dc and then wrap the yarn the opposite direction to complete this stitch? I know that there is really nothing wrong either way, but shouldn’t the wrap be the same direction? It would be easier for the hand to remember the same movement rather than switching all the time. You also, in some cases, will get a very different look. If you make the second wrap the same as the first you will get a softer blanket. You are putting a little bit more yarn in each stitch, therefore making it softer. It doesn’t seem like much but it does make a difference overall. Hmm. Interesting question, Lora. Now I’ll have to grab a yarn and hook and experiment with the different textures you’re talking about! Honestly, neither direction of wrapping was intentional. I learned to crochet from my mother when I was 8 and have been wrapping it the same way as her ever since. 🙂 One of the things I love about crochet is that it’s handed down through generations and there’s not one “right” way to do any of it. I would love to know more though about what you’re saying with making the softer texture, etc, so I will definitely check that out. Thanks! That’s funny – I noticed you did your stitches differently too but I instantly thought – “OMG, I’ve been doing it wrong for all these years!” LOL! You yarn over from the back and I yarn over from the front. I tried it your way and it feels awkward for me but it still gets the job done. I also hold my crochet hook “underhanded” (like a pencil) while I think the majority hold it “overhanded”. And I agree, I love that there are no real “rules” to crochet, that’s a huge part of what makes it fun – endless possibilities. Thank you for the beautiful stitch tutorial! Haha, isn’t that funny that we all assume we’re wrong? I’ve had the same thought when watching other people’s videos. I like to think about how none of use would have had any idea how anyone but our grandmothers and mothers did it before the era of Youtube. I’ve seen other people do the underhanded technique too. It’s so cool how we all end up with the same result even though we might approach crocheting differently! Haha. My mom and I took classes to learn to crochet and she was having a hard time and did some stitch that we called The Karen stitch ( of course because her name is Karen) it wasn’t like any stitch the teacher had ever seen. So seeing this stitch with my name in it made me think of that and I had to share it with you. ? That was over 5 years ago and she gave up trying to learn. I have just finished a blanket and wanted to put a substantial bordenr on it. Flicking through pinterest I xame accross your pattern for the suzette stitch. I did 2 rows of double ( uk terms) an then 2 rows of suzette stitch in different colours, it loojs good. Thank you for sharing , I am going to have a go at your bag when I get some cotton. Oh that’s great to hear! I wouldn’t have thought of using this stitch as a border, but I bet it’s really lovely! I CANNOT seem to get the hang of this stitch! I tried using fsc and I liked it at first… the first row went as it should have. But then every time I got to the end of the second row, I had to end in a sc/dc combo because the second to last stitch was a dc from the first row. So then I went back and tried NOT chaining one at the end of the fsc and that was a disaster. So THEN I frogged the fsc and tried regular chains and that was no good either. Ugh, I don’t know why I can’t get this one. I’ll keep trying! I LOVE this yarn and pattern! I found this while searching for a great baby blanket stitch. I am in love! It feels so luxurious while being so quick and easy to do. I also found an added bonus… not only is it a great texture but adds a great detail when stripping. I am happy to share a picture if you email me. 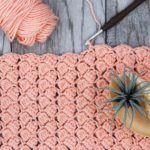 what size crochet needle are you using to do the suzette stitch? Just found your pattern(s) and videos about a month ago. Really enjoy the way you explain how to do the stitches. Can’t believe I just sat here and read ALL of the comments. Had to laugh when others mentioned the same things I had questions about. Guess it pays to read everything. LOL Thanks for all of your help. Haha! You win the award for most thorough blog reader! 🙂 I’m happy you’re here too, Jean. Thanks for saying hello. I’m left handed and tremble every time I try to crochet or knit. My mother taught me years ago by facing her and watching how she stitched. Her knitting for instance was pearl from my perspective and her pearl was knit. So in essence, it’s backwards. If I make a sweater and have to deal with buttons buttonholes its mental anguish to know for sure I start on the correct side. I don’t know if there is a solution to this or if every person who is left handed deals with this. Any insites from you would be most appreciated. Love your creations. That sounds really hard! MooglyBlog.com has a lot of great left handed video tutorials that might be helpful. Also, I know searching “left handed crochet tutorials” on Youtube can be useful too. Hope that helps! How many foundation sc do I need for 2X-2X? Thanks!!! A 2x of which pattern?